During cataract surgery, Dr. Thomas J. Byrd uses the Alcon® ORA™ System with VerifEye+™ to assess your eye and choose the best intraocular lens (IOL) for your needs. With this technology, he can help you enjoy better vision than you may have had in years. Because of the ORA™ system’s precision, Dr. Byrd can dramatically reduce the number of patients who need glasses after cataract surgery. He is also able to more effectively provide treatment to patients suffering from astigmatism. Contact the Byrd Eye Clinic to learn more about the ORA™ System at our Downriver Detroit, MI, practice. What Is the ORA™ System? 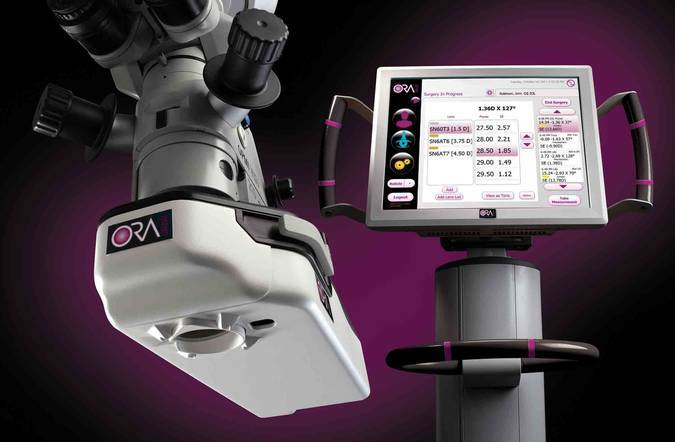 The ORA™ System gathers information from no-contact, intraoperative wavefront aberrometry during cataract surgery. This data gives real-time measurements of your eye and its structure to Dr. Byrd, allowing him to select the most accurate strength and type of inctraocular lense (IOL) for each patient. The advanced system takes into account multiple data sets, including magnitude and axis of astigmatism, and aphakic, pseudophakic, and refractive measurements. The aberrometer measurements also help Dr. Byrd determine the proper limbal relaxing incisions (LRI) required to correct the structural abnormalities of astigmatism. How Does the ORA™ System Work? The innovative ORA™ System will measure your eye with wavefront technology. This advanced technology creates refractive feedback from your eye using light and multiple cameras. The information collected allows our trained team to know when your eye's refraction is fully stabilized, and what strength of IOL is required for that stabilization. These details enable us to more precisely choose the correct power of lens for you. The ORA™ System provides real-time measurements, ensuring that Dr. Byrd can perform a more accurate procedure with predictable results. The ORA™ System will not come in contact with your eye, so it will not cause any discomfort or raise the risk of any side effects. The technology enables faster, more precise procedures, and reduces the number of incorrect IOLs that are placed. After your surgery, we will also analyze your eyes, using the built-in AnalyzOR database of the ORA™ System. The post-operative data allows us to review the outcome of your surgery and compare results against initial measurements. We will also be able to compare results against similar cases within a global database. ORA™ enables our team to choose the most suitable type of IOL for you. You will most likely rely far less on glasses or contacts after treatment. It is also possible that may not need corrective eyewear at all following cataract surgery. The advanced technology can help provide more precise treatment, especially for patients who have previously undergone LASIK surgery. This technology makes it much easier to place toric IOLs, a type of intraocular lens used to correct astigmatism. The ORA™ System also helps Dr. Byrd place limbal relaxing incisions, which help to further treat astigmatism. If you are preparing for cataract surgery, you deserve care from a doctor who uses the latest techniques and tools. Contact Byrd Eye Clinic to schedule an appointment.